I am so thrilled to be blogging my first of many vendor features! First up....Great American Popcorn Co. of Morton! I first tried their popcorn while I was working my booth at a recent bridal show. They brought me some of their Wedding Cake popcorn and OH MY! It seriously tastes JUST LIKE CAKE, but in popcorn form. What is better than that?! How can they make your wedding better? Great American Popcorn Co. of Morton offers Popcorn Bars with your choice of countless flavors and colors! These can be customized to match your wedding colors and/or theme. Popcorn Bars are such a fantastic thing to have at weddings because it allows your guest to freely snack whenever they want and it keeps them happy all night long (I promise they will love you even more for this)! You can also do a Candy Bar! Need wedding favors? They can make those for you too! 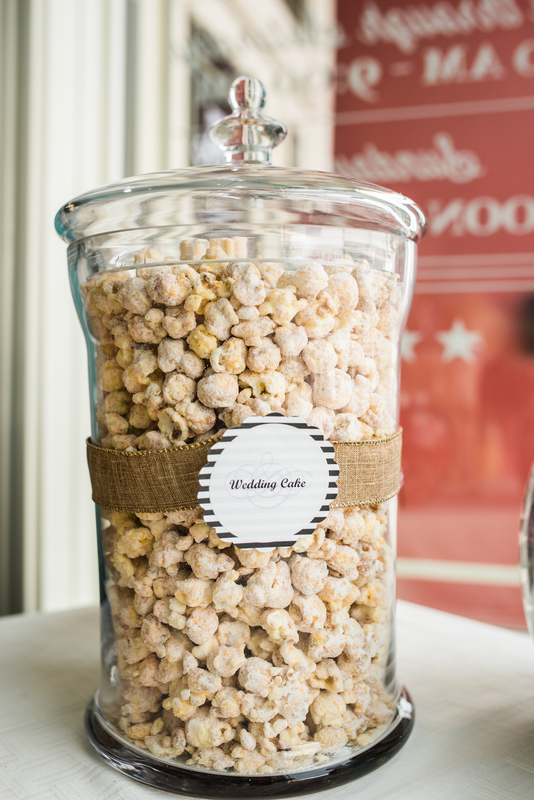 Favors consist of popcorn, candy or truffles with customized labels with your wedding date or your new last name! What a sweet way to thank your guests and save you time from making your own! When I asked Greg Nichols, the owner, why he wanted to open a popcorn store he told me, "We were looking for a retail business that would be fun for our customers throughout Central Illinois, and would be a great complement to other downtown Morton businesses." I can say without a doubt that they have already achieved that goal in the 6 months they have been open. When you walk in, you will be greeted with friendly smiles and the chance to sample from their 50+ flavors of popcorn! Yes, I said 50+! A few of their favorites are Thin Mint, White Cheddar, and Jalapeno Cheddar. Some of my favorites I have tried are the Wedding Cake, Poppy Chow, and Tiger Butter! When you visit, don't forget to also try their hand-dipped ice cream, craft and vintage sodas, fudge , and gourmet chocolates! You won't walk out of their store unhappy! A big thank you to Greg and his wife, owners of Great American Popcorn Co. of Morton, for allowing me to come in your shop and photograph all the fantastic popcorn and sweets you offer! And a thank you to Lisa for your kind words and all the yummy samples! Their store is located at 126 S. Main St. in Morton, Illinois! Another vendor feature is coming soon! Next up...a NEW venue in town!